This week I will mostly be doing… | An alien voice under a duvet of dreams. Posted by phoenixaeon in Biathlon, Bog Child, books, Children's Literature, EA300, Illustrations, Olympics, OU, reading, Ski jumping, TMA05. With Princi off school this week there is no time for any real study. So I have decided to get some reading done – which means a little of catching up AND getting ahead. Catching up in the sense of reading Mildred D. Taylor’s Roll of Thunder, Hear My Cry, the book I missed during the last block (I missed Peter Pan in the block before, and I probably won’t get around to going back to read it, so didn’t want to miss something else), and reading Siobhan Dowd’s Bog Child in preparation for the ECA. Well, I finished Bog Child last night. It’s a fabulous book. Set against the backdrop of the 1981 hunger strikes, the main protagonist – Fergus – finds the body of a child whilst digging for peat with his Uncle. This discovery leads to strange dreams and first love, while battling against the reality of Northern Ireland during the Troubles. The story draws you in from the start, the opposition of politics vs religion glaring apparent throughout the novel. The shadowing of the contemporary Troubles against a Pagan tribe from 2000 years ago provides a sense of – in the terms of BSG – all of this has happened before, and all of it will happen again. To say I enjoyed the story would be an understatement. I’m looking forward to a second, and possibly a third, read through closer to the date of the ECA. For now, though, I’ll just let the story percolate in my brain. That leaves me with Roll of Thunder to read over the next few days, and maybe one or two of the critical essays during the evening when Princi is sleeping. I can definitely see some contrasts and comparisons that could be made between the two books, which means I am already formulating arguments. Woohoo! I’ve just got to make sure I don’t get too far ahead of myself, as I have two more essays to do before the ECA. Oh, which reminds me. The next essay is on illustrated children’s books. While having a little trawl on the net last night, I found this: illustrated envelopes. How cool would it be to receive a letter with an envelope like these? I want one! 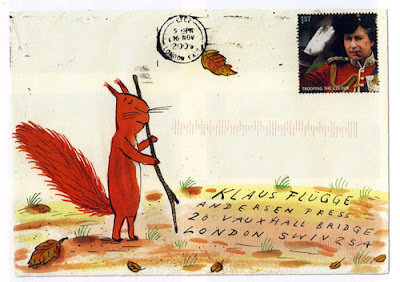 Envelope illustrated by Axel Scheffler. As well as all the reading, there is also the lure of the Winter Olympics over the next couple of weeks. I’m already staying up way past my bedtime so I can watch (some of) the ice skating. I’m glad that the biathlon and ski jumping is on earlier in the day – or evening as is the case. The first biathlons have provided some of the best, and most shock, results. I wonder if the two pursuits on today will also prove as uncallable in terms of predicting the winner? I’m just upset that I missed the snowboarder cross last night, it sounds as if it was extremely exciting! Anyhoos, time to get back to the reading while Princi is distracted.